We are giving away 2 sets of 4 tickets, so the whole family can join the celebrations with an exclusive behind closed doors experience at The Finest Toy Shop in the World on 28 April 2019. 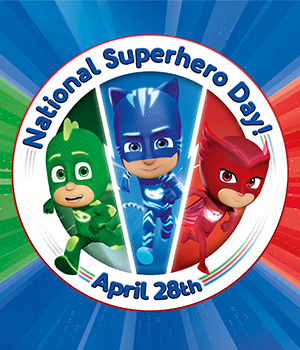 This is your chance to be a part of an exclusive morning of activities where you can meet your favourite PJ Masks characters, watch never seen before episodes on Tiny Pop, receive an amazing goody bag and much much more! All you have to do to win is answer this very important question! Winner will be chosen at random and contacted directly by Monday 22 April 2019. Terms & Conditions: The prize is one of two sets of tickets for the winner and three family members/friends for entry to a PJ Masks experience (the “event”) at the Hamleys Regent Street store on 28 April 2019. The prize comprises admission only and does not include travel costs or any other expenses. The competition opens on 9 April 2019 and closes at midnight on 18 April 2019. Winners will be contacted by Hamleys via email to confirm attendance, where winners have not confirmed attendance by 23 April 2019 Hamleys reserves the right to choose an alternative winner as a replacement. Winners may be required to participate in photography of the event. Tickets have no alternative cash value and are non-transferable. Entrants to the competition must be aged 18 or over and a UK resident. Under 18s may attend the event with the winner provided they are accompanied at all times by the winner. A list of the names and locations of the winners will be maintained and available on request. Hamleys reserves the right to cancel or change the time or venue of the event at its discretion without liability. The promoter of this competition is Hamleys of London Limited, 2 Foubert’s Place, London, W1F 7PA. WIN a family ticket to Twirlywoos Live with Hamleys in London! From the producers of The Very Hungry Caterpillar Show and Sarah and Duck on stage comes another delightful show for young audiences. With beautifully inventive puppetry the show promises a cast full of all your favourite characters from the hit TV show. Which of these lights are used in a theatre? Terms & Conditions: Prize package is 1 of 2 family tickets (£48.00 per family ticket) to Twirlywoos Live. Valid between the 1st of March to the 4th May 2019 ONLY. Competition closes on 10 March 2019. Subject to availability. Tickets are non-transferable, non-refundable and have no alternative cash value. Entrants must be 18 or over. This prize does not include travel. MEI theatrical on behalf of Twirlywoos Live reserves the right to amend or revoke this offer at any time. Competition open to UK residents Only. 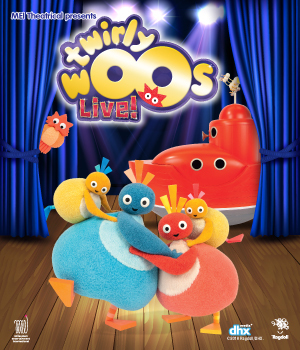 Competition promoter is MEI theatrical on behalf of Twirlywoos Live and has authorised its agency Boom Ents to run this competition on their behalf.